A version of this article appeared in the Winter 2017-18 issue of The Dialogue. Credit also goes to Gisele Siebold, Natural Awakenings Lancaster, Tom Ryan and Leroy Hopkins of LancasterHistory.org for compiling the story. When European settlers arrived in Pennsylvania, indigenous peoples were already using a dialogue format called “talking circles” to make decisions and address conflict and harm in their communities according to a 2014 study, “Introducing Healing Circles…into Primary Care,” in The Permanente Journal. Unlike many early colonial governors, William Penn sought to learn from these indigenous practices and live peacefully side by side. 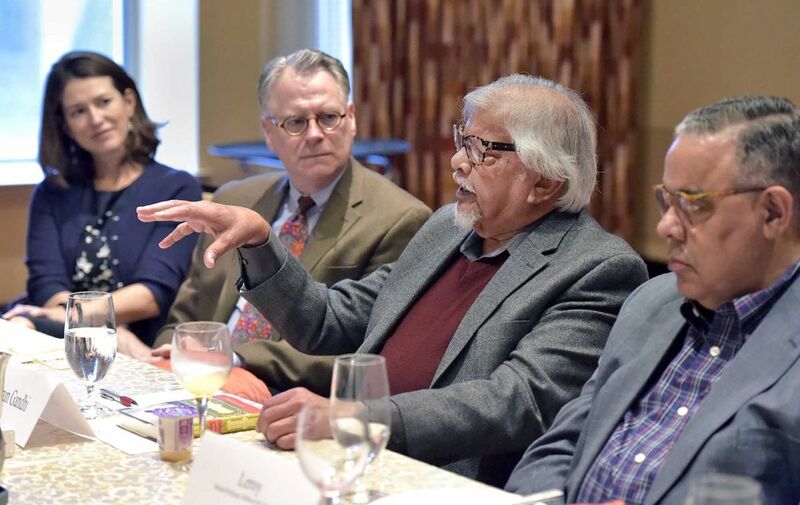 This founding tradition of inclusive community was a central point of discussion emphasized by Tom Ryan and Leroy Hopkins from LancasterHistory.org (pictured left and right) when Arun Gandhi met with Advoz and community leaders in Lancaster this past May. After discussion by numerous community leader at breakfast, Gandhi went on to affirm the conversation, telling the story of an ancient refugee people whose emissaries promised to the hosting prince, not to overflow his teacup and spill his community’s resources, but to instead, simply add sugar and dissolve into their new community. In one famous local exchange during the writing of the 1744 treaty held in Lancaster, Chief Canassatego urged the 13 colonies to unite in a participatory form of government like the Iroquois confederation. He dramatically presented Benjamin Franklin a single arrow, then broke it over his knee. Then he gave Franklin 13 arrows but failed to break them. The demonstration made such an impression, that the founding fathers agreed to pursue a federated and democratic governance rather than re-create the monarchy that established the colonies. And the 13 arrows are now enshrined in the talons of the eagle on US currency. We have learned much since 1744, but are still learning how to live side by side. Our founding documents and laws did not include the voices of women, Native Americans or people of color. But over the last 30 years, the fields of mediation and restorative justice have blossomed alongside methods for inclusive decision-making like the Circle Process (and other methods advocated by the National Coalition for Dialogue and Deliberation), hearkening back to the wisdom of practices used by various Native American tribes. As a community like Lancaster, with the highest per capita number of international refugees, uses and practices more intentional dialogue processes, we are not only handling conflict better, but naturally, proactively building relationships and community across the many cultural and political divisions that still divide us. That, I believe, is a tradition worth continuing.